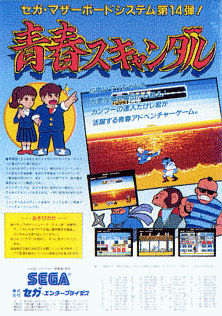 The term “beat-em-up” is loosely ascribed to any action game wherein large quantities of enemies are dispatched by a much smaller number of heroes in hand-to-hand combat. 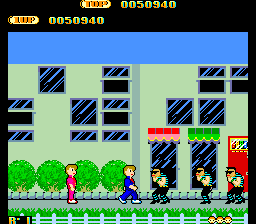 It is mostly used to describe belt-scrolling brawlers in the vein of Double Dragon or Final Fight, wherein punks flood the screen and the protagonists use their fists of justice to clean the streets of human scum. 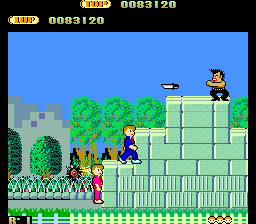 However, before this genre was set forth in Renegade, Irem’s Kung Fu was released two years prior to kickstart the lesser-acknowledged “2D Kung Fu Beat-em-up” subgenre. These sorts of games focus less on enemies which take several hits and more on throwing out endless waves of attackers who usually don’t take more than one or two hits. 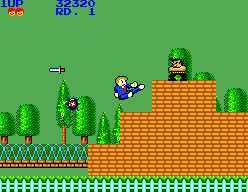 This genre quietly prevailed after KFM with examples like Data East’s iconic Bad Dudes, Taito’s three-screen endeavor The Ninja Warriors, and Namco’s severely gory Splatterhouse. This genre more or less faded around the mid-nineties, but the more famed iterations of this genre as just mentioned are still remembered fondly today. And then there’s My Hero (known as Seishun Scandal in Japan), which nearly everyone has forgotten about and probably with good reason. 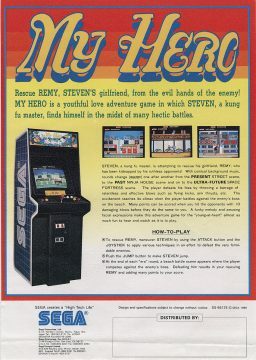 My Hero has you play as a young lad named Steven/Takeshi, depending on what region you’re playing. 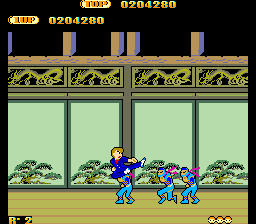 In true Double Dragon fashion, the game starts out with your girlfriend (named Remy or Mari) kidnapped. Though instead of being mobbed in the streets, she is somewhat humorously taken away by a gang boss with a silly haircut who just runs up and yoinks her before exiting stage right. 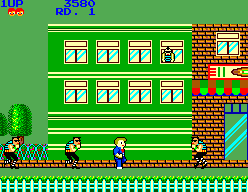 Your goal is to travel through town and get to the end of the level while fighting off punks in shades who rush you en masse. Your basic attack button punches forward, throwing a low kick if holding down, a high kick if up-forward, and an overhead punch if straight up. 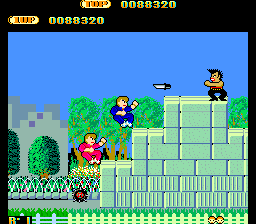 There is also a jump kick button which is not only your most useful attack, but will be required to jump over lots of gaps. 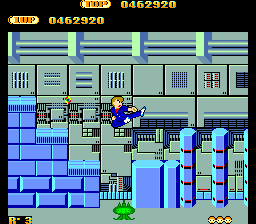 Yep, there’s some platforming in addition to the fighting, where fire or spikes awaits at the bottom of shafts, but these usually aren’t so bad to deal with. What IS bad are obstacles like bottles drop from jerks lounging out in windows indestructible spiked balls that bounce around. Occasionally, you’ll come across an unfortunate fellow bound in ropes being harassed by a red punk who’s a bit tougher to hit than the average goon. 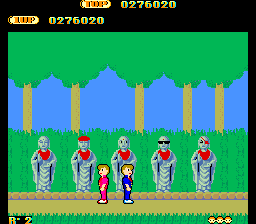 If you do manage to take out this jerk and run past your roped-up buddy, you free him and he acts akin to the shadow doubles from Ninja Gaiden II. 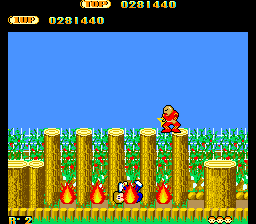 He moves as you do and attacks in sync, though it’s hard to actually have him hit anything (unless you’re standing still as he punches in the opposite direction you do) and he dies pretty easily, particularly when attempting to jump over deadly obstacles. Still, he’s the closest thing to a power-up you get in this game, though something like a weapon or some invincibility potion would have been nice. 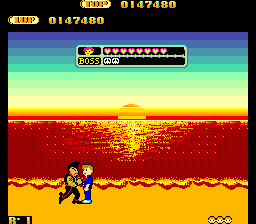 While he won’t likely make it to the end of the stage, if you manage to do so, you fight the gang boss at a sunset beach, where the game now takes on something of an early fighting game bent. You have to hit the baddie ten times while he tries to do the same to you. He can be hard to hit, but patient jump kicks are usually the best way to go. You seem to get your girlfriend back as you attempt to console the guy you just beat up (you’re just that nice a guy), but after you have summarily thrashed the boss, a time machine pops up from out of the sand and a new baddie scuttles up from offscreen, snags your girlfriend, and whisks her away to ancient Japan. What. 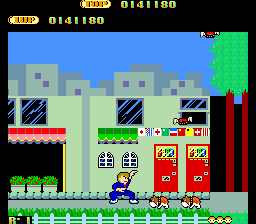 This is where the game flies completely off the rails and introduces ninjas (of course) as your main source of antagonism instead of street punks. 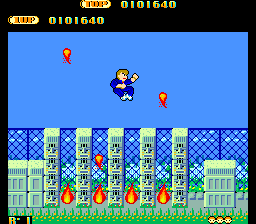 It’s also where the difficulty takes a colossal spike as the enemies get more aggressive (lookout for small ninjas with big shuriken) and the traps become more numerous (like lots of bombs being chucked from offscreen). So you topple the ninja leader, only for yet ANOTHER time machine to pop out of the sand (why don’t beachgoers with metal detectors ever pick this crap up?) and bring out a blue gorilla man who steals your gal and takes her to the future. Feel free to scream like Charlton Heston, as your main enemies are now apemen in shiny suits. There are also obnoxious robots that shoot bouncing fireballs and this creepy little alien who skims the ground and spits deadly projectiles straight up. It seems slightly less heinous than the ninja level but still isn’t a free ride. After this level, you cycle back to the present with the difficulty raised even higher. However, good luck even getting that far, as this game is merciless and pretty unfair. The hit detection can be a bit sketchy, some traps and enemies are real jerks to try and beat, and you only get three lives before your game is over, with one hit being all it takes to knock you down. You can’t even continue on the spot either! My Hero‘s extreme difficulty certainly works against its enjoyment, and the sound gets a bit annoying after a while too. 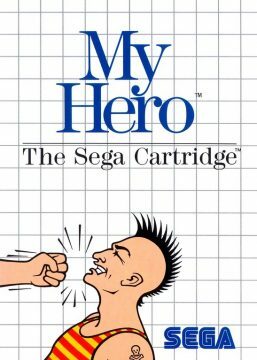 The graphics are okay for their time, but the bottom line is that this is just not one of Sega’s best titles. What it tries to do has been done better by other games, and it ultimately just doesn’t come off as very fun. It’s worth playing just to see how incredibly wacky its design and premise is, but the frustration factor outweighs its potential good. 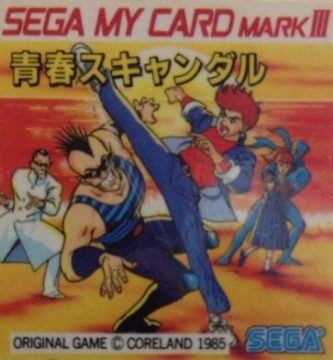 Still, despite its obscurity and not-greatness, it somehow got a release to the Sega Master System. The SMS port had to cut down on a few things from the arcade rendition; namely, the past and future levels are now nonexistent. You only keep cycling through the city level, albeit with somewhat different level structures each time. Gone is the potential buddy you can rescue from captivity, making the game even harder than before. 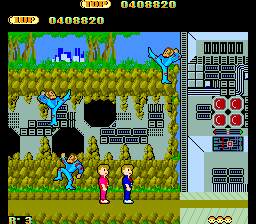 It hasn’t really scaled the difficulty down too much from the arcade original, but at least there’s not much motivation to play past the first level as the terrains understandably get old after a while. The sky and border is cast in an ugly green, but the graphics are otherwise fairly accurate to the arcade. Still, the unrelenting harshness and repetitive nature of My Hero makes it bad no matter what medium on which you play it. Its quirky premise may warrant a look, but some games need more than quirk to sustain a potential legacy. 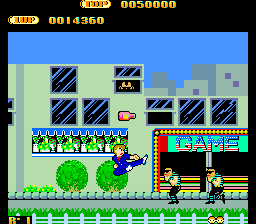 My Hero is one of many old arcade games to have been forgotten, but in this case, it brought it on itself.